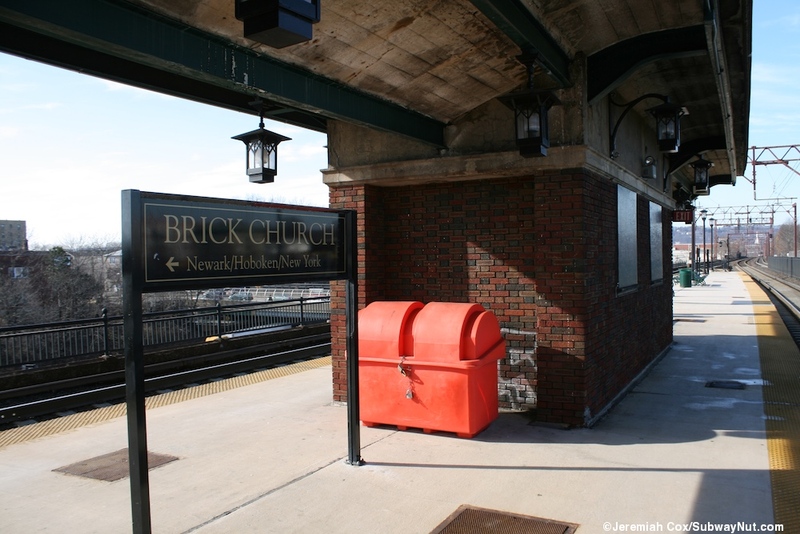 Brick Church is a station located on a concrete viaduct above East Orange, New Jersey and is named for the original Second Presbyterian Church of Orange located just north of the station. 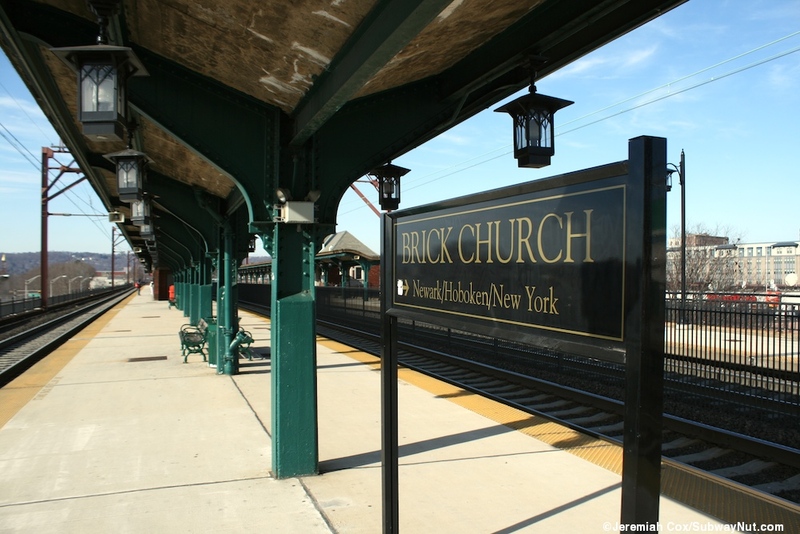 Although the stop is named after a local landmark and not after the actual City of East Orange (who's East Orange Station is the next stop east and across from City Hall) Brick Church has vastly more ridership than East Orange (1,610 compared to 282 average weekday boardings at East Orange in FY2012). 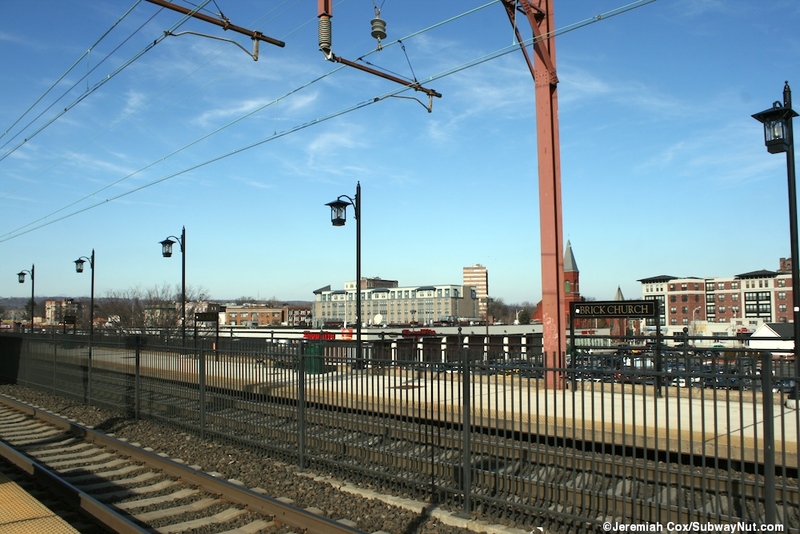 Historically, this station was the one stop for the Oranges between Newark and Summit on long-distance trains to Buffalo and beyond including the Lackawanna's post-war streamliner the Phoebe Snow. 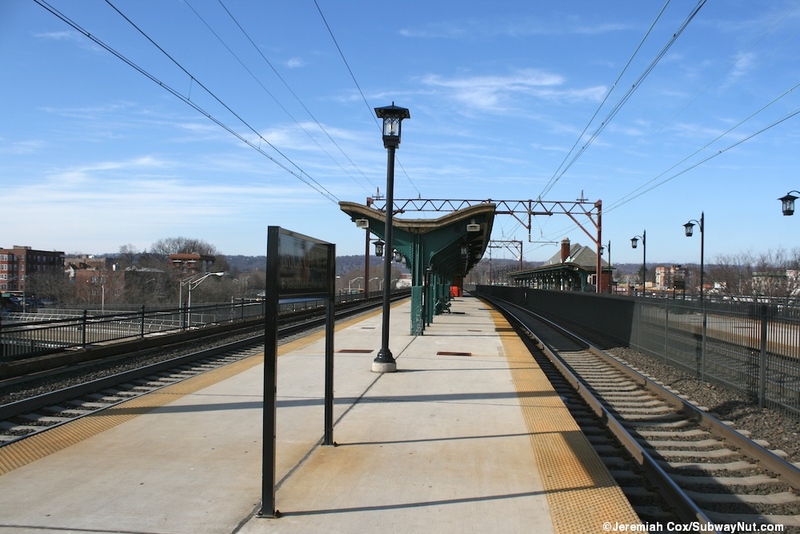 Today service is provided on weekdays twice per hour in each direction or better with most MidTOWN Direct trains to Penn Station on the Morristown Line and the hourly Gladstone Branch Arrow-III trains to Hoboken stopping at the station. 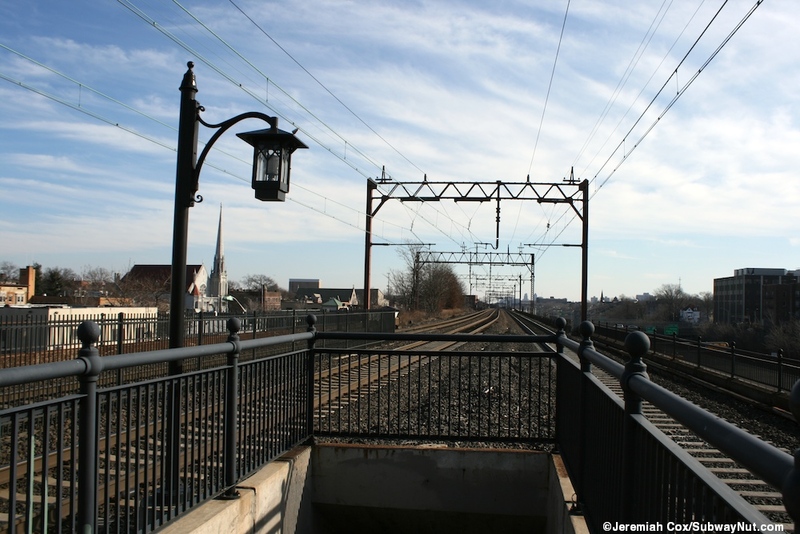 The station is located on a concrete viaduct just north of the I-280 expressway (Freeway Drive West, a service road is parallel to the southern end of the viaduct) that is in an open-cut trench beneath local streets. 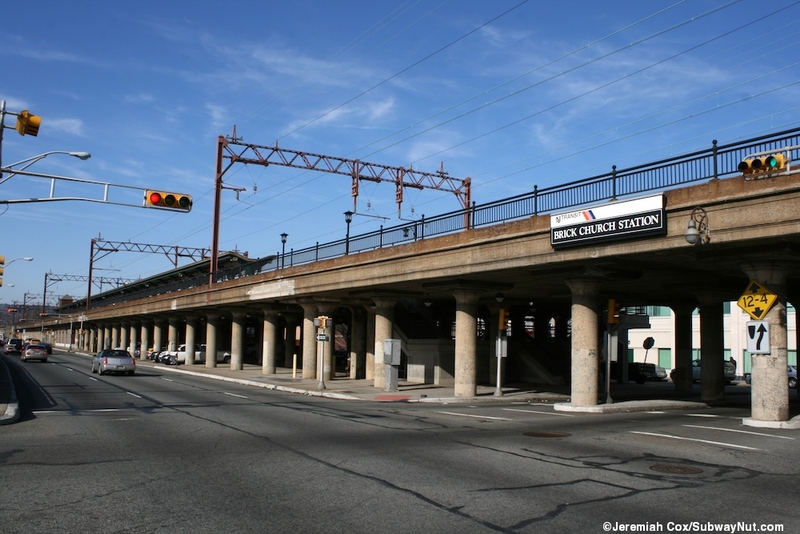 The concrete viaduct here is held up by numerous round concrete columns. The station has three tracks. 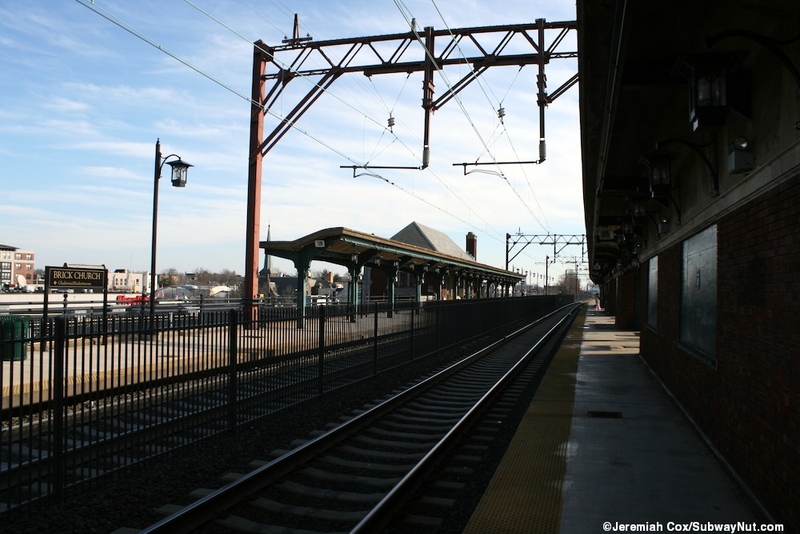 The platform layout is identical to East Orange with the side platform for the Gladstone/Hackettstown-bound track and an island platform for the other two tracks. Just north of the station is a strip mall with with a large parking lot designed for shoppers, not commuters. 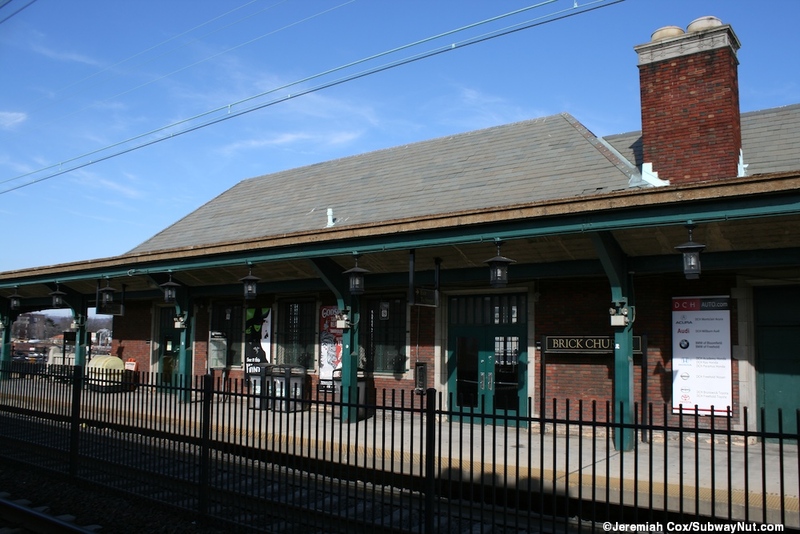 The station is in the Jacobian Revival style and was built when the tracks were elevated above street level and grade separated in 1921 to 1922, designed in-house by Lackawanna Railroad architect F.J. Niles. 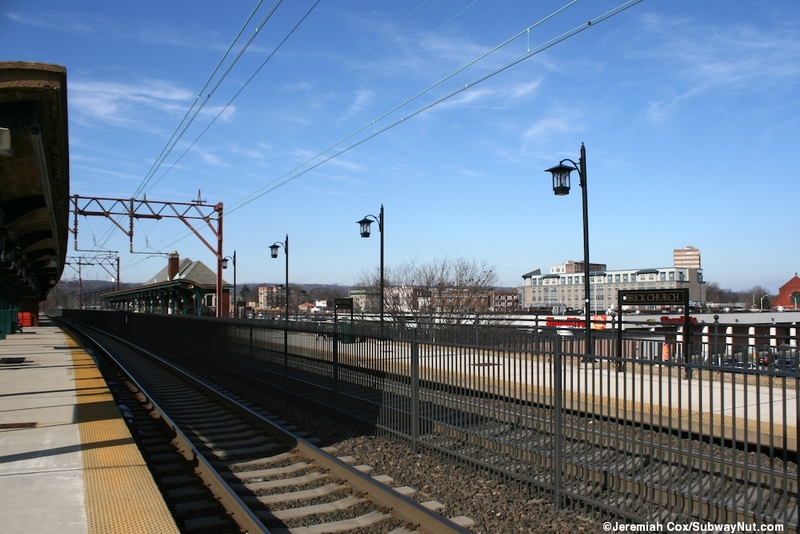 (NRHS information) The middle of the two platforms have green steel beams holding up original canopies that are at slight angles. 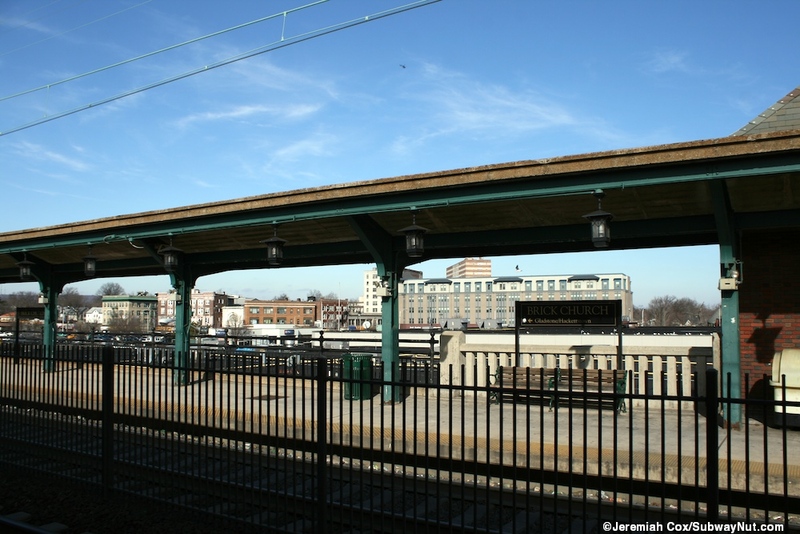 The island platform's canopy is 544 feet long and the side platform's is 246 feet. 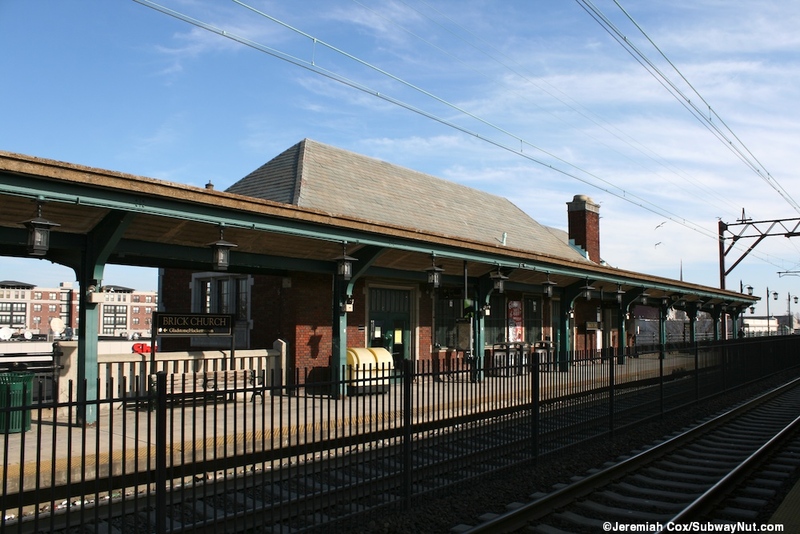 The side platform has the upper level waiting room of the station building and ticket office. 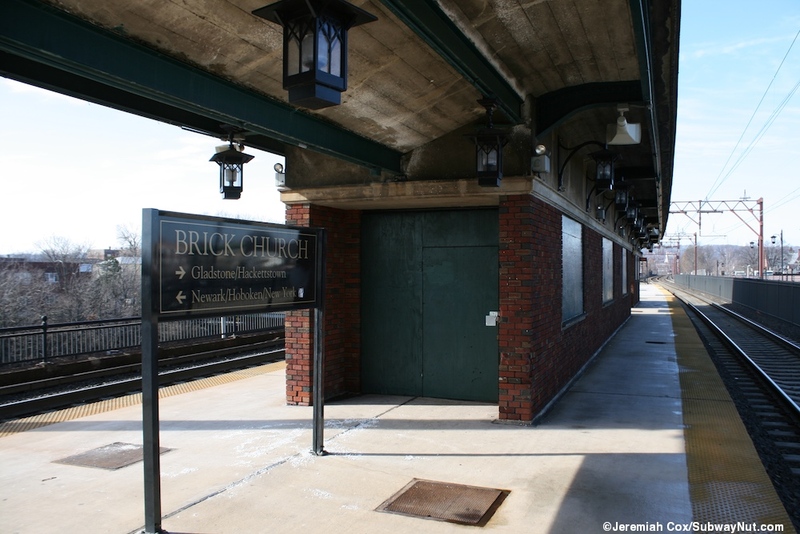 The upper portion of the station building overhangs Brick Church Plaza/Railroad Place with concrete beams holding up the building in the middle of this street and covering a bus stop and passenger drop-off area. The walls of the actual room are made of brick with decorative concrete molding holding up a slightly gabled roof. The platform level waiting room is open (when I visited in January 2012 signs informed passengers waiting in the warmth that its hours were about to change to be the same as the ticket office below, it used to be open all day) at the same hours as the ticket office down below from 5:00am to 1:00pm. Inside are cream colored walls and concrete benches. Two staircases that lead down from this waiting room on each side of the area and turn at intermediate landings. 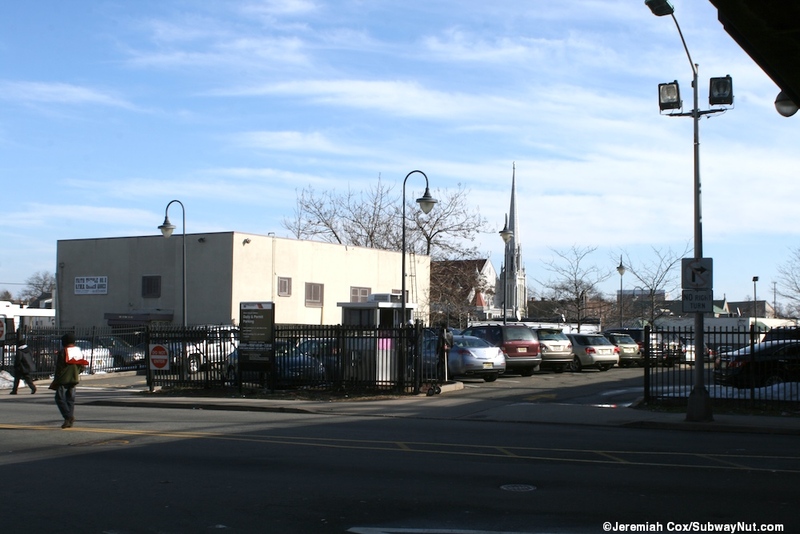 One leads directly down to the street next to the ticket office along the east side of the little covered drop off area. 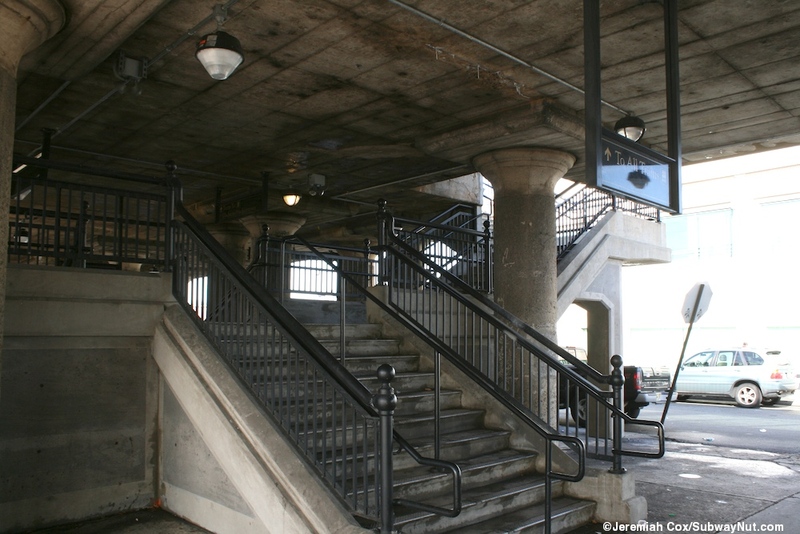 The other leads down to the main level of waiting room nestled directly beneath the railroad platforms and tracks above. The main level of the ticket office houses the ticket windows, and a nice wooden bench in the middle, doors lead out in all four directions. 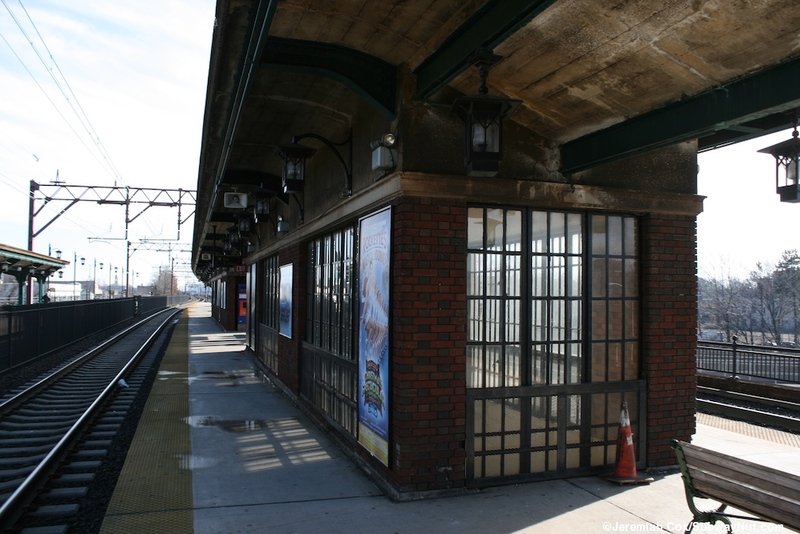 The interior walls are darker with lots of brown molding, including around the concrete structural pillars that hold up the viaduct in the middle of the waiting room. There are restrooms that are quite large and are more Men's and Women's Lounges with some seating inside them. One door leads out directly alongside a staircase (that is always open) up to the middle of the island platform. 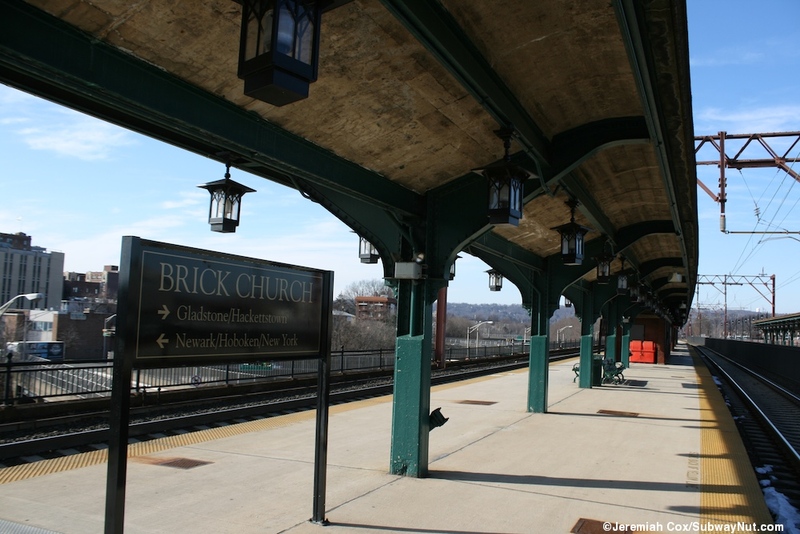 It arrives at the platform in style inside a small brick enclosure with plently of light from walls of casement windows. This is unfortunately the only small brick enclosure on the island platform that is still open. 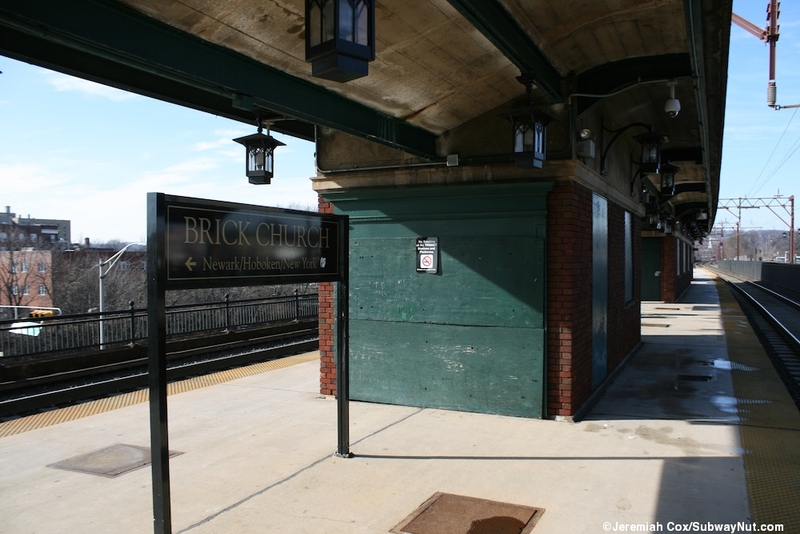 There are four other brick enclosures boarded up beneath the canopy of the island platform. 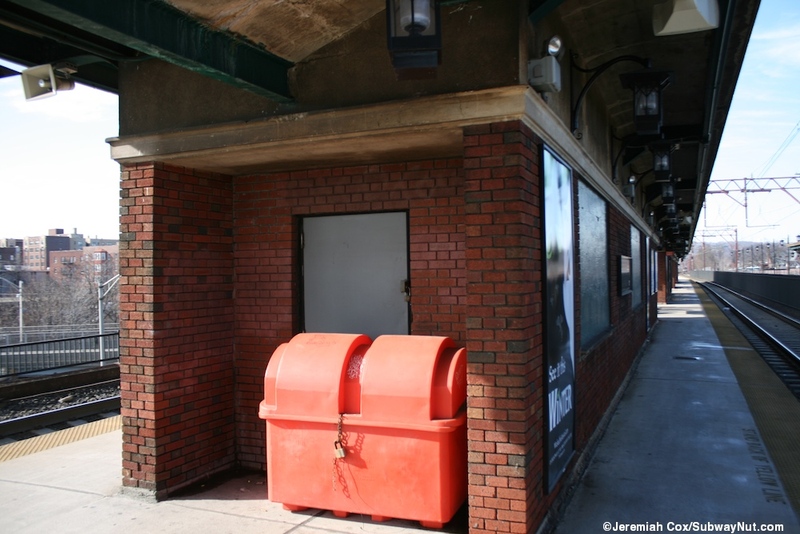 Two were waiting shelters, one was for a concession (I assume a newsstand type kiosk) and final one at the southern end for a freight elevator to get baggage up to the platform in the days of long-distance trains stopping at the station. 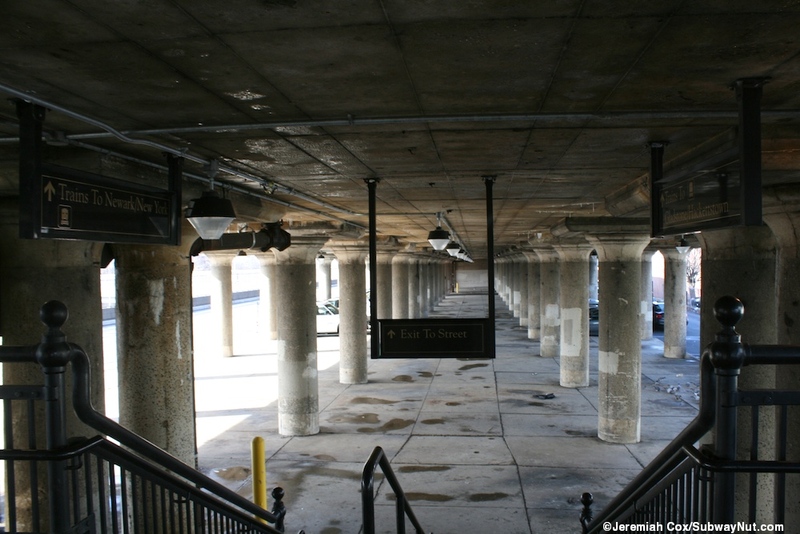 At the exposed ends each end of the platforms is a staircase these lead down to an intermediate landing and a single staircase leads down to the large dark plaza beneath the railroad viaduct below. 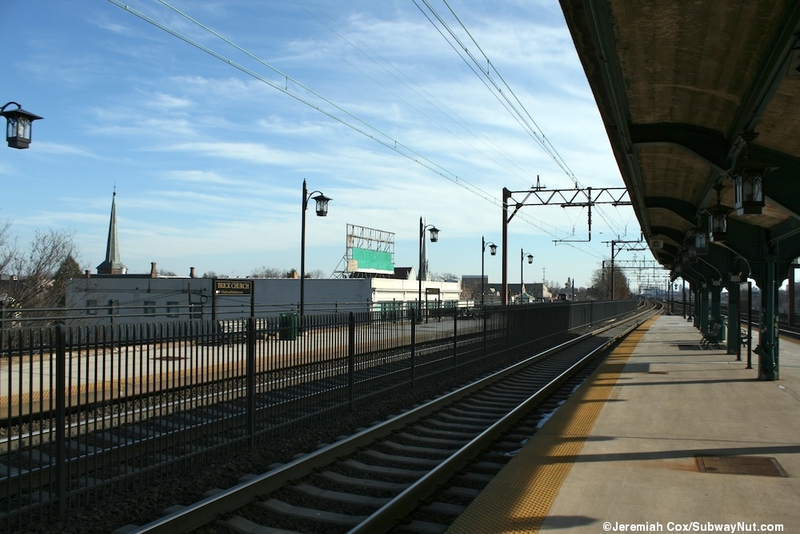 The eastern end of the platform leads down to the Halsted Street, the western end to Harrison Street.